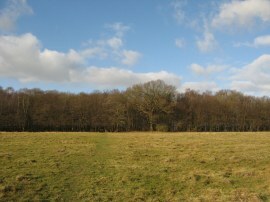 I did this walk on Sunday 22nd January 2012. 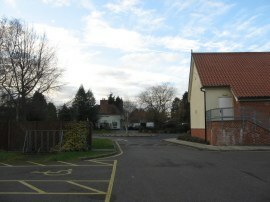 I drove over to Stock where I parked in the village hall car park which is conveniently on the route of the St Peters Way. From the car park, photo 1, I headed up to the end of Common Lane before turning right for a few yards down B1007 High Streeet, passing the large Greenwoods hotel. 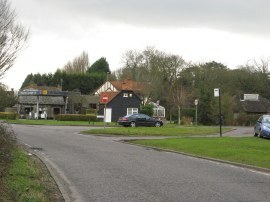 The route soon leaves the main road though, heading to the left up Crondon Park Lane. The route then heads along the road soon heading gently downhill with a field to the right and woodland to the left, photo 2. Reaching a red brick house I joined a footpath on the left that headed downhill through the trees. For a while this heads down a stepped wooden boardwalk before crossing a small stream, the path levelling out with the fairways of a golf course on the right and woodland still to the left, photo 3. 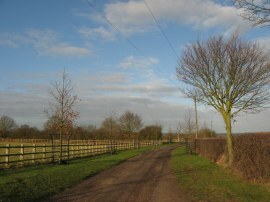 This stretch of path leads up to Swan Lane where the route heads very briefly to the left before joining a footpath at the entrance to Fristling Hall. On my map the route is shown as heading down the driveway of the hall but there was a newish kissing gate and footpath sign pointing into a field besides the entrance to the driveway which seemed to indicate the path headed along the field edge so this is the route I took, following the inside edge of the field running besides the driveway. Reaching the end of the field there was no onward footpath so I headed through a gate back onto the driveway, photo 4, for the remainder of its length down to the buildings of the hall themselves, photo 5. On the map the St Peters Way is then shown as heading round the back of the buildings however there was a clear sign directing the path along a footpath on the right that runs diagonally across a paddock, down towards the small Cockshill Wood where the route joins a broad farm track where I headed right. When I had entered the set of footpaths to Fristling Hall there was a notice regarding an order to reroute some of these footpaths and it is likely that in the future the St Peters Way will take a rather different route through this area than the one I walked, assuming the statutory diversion order goes ahead. 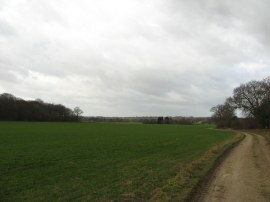 The stretch of track I was on soon leads to a road where I continued ahead for a short distance before joining a footpath on the left which runs down the right hand edge of the field. In the distance I could see the A12 and hear the noise of the traffic being blown across on the strong wind. On most of the walks I have done along the St Peters Way I have mentioned that it had been windy but this day was by far the windiest with a persistent breeze of around 20mph blowing throughout the day. Reaching the bottom of a hill the route crosses a small wooden footbridge and bears to the left along a field edge following the course of the River Wid. 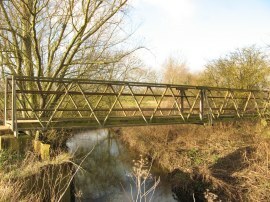 Reaching Gang bridge, photo 6, the route crosses over the river and heads up along another field edge path with a stream running on the left. 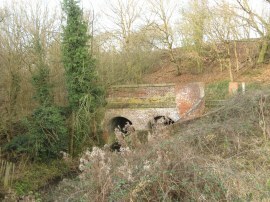 Reaching the top of the field the route heads down a small flight of steps to pass through a small brick lined tunnel running under some railway lines, photo 7, the left hand tunnel for the stream and the right hand one for the footpath. 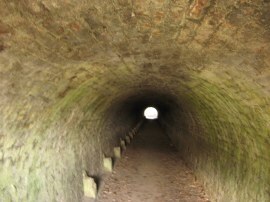 This long narrow tunnel was quite low, photo 8, and my head easily touched the roof if I stood on tiptoe. Once under the railway the path continues ahead along a track running across the middle of a couple of grass fields which were surrounded by trees, this path, photo 9, leading up to the B1002 road in Margaretting. 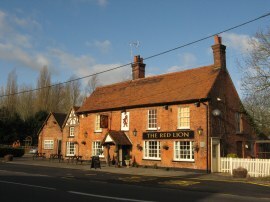 Here the route heads to the left along the road, passing the Red Lion pub, photo 10, before joining a footpath on the right that runs down besides the buildings and stables of Tollgate Farm. From the farm the route heads through a concrete tunnel under the A12. Once under the road the route continues on along a field edge path which winds its way round passing along the edge of Bushey Wood and along another field edge path to eventually reach Dog Kennel Lane. 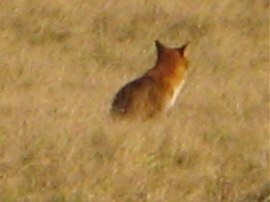 As I was walking along the lane I spotted a pair of foxes, photo 11, out in the middle of the field away to the right, a very common sight in Walthamstow but not one I see so much while out walking during the day. Approaching a house the route joins a footpath that heads off to the left for a few yards before passing through a gap in the hedge to join another field edge path, the route once again running parallel to the lane. This path heads down past the buildings of a farm before joining another field edge path that heads up towards Well Wood and then round over a field to Box Wood, photo 12. 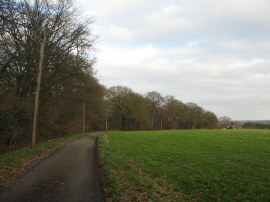 The path heads through the woodland before joining a short stretch of driveway by a house. This leads up to another crossing track where I headed slightly off course as I continued straight ahead to make my way across Millgreen Common. At first I followed a narrow path lined with Holly bushes before then following a path through a more open area of woodland that runs alongside Moore's Ditch down to Mill Green Road. On my map the route is actually shown as heading a bit further to the right along the crossing track and then cutting through a corner of Millgreen Common to reach Mill Green Road several hundred yards to the right of where I joined the road. The route as marked on the map then heads along the road up to the point where I joined it, both ways then heading to the left down the road. However having subsequently looked at the latest version of the OS map the St Peters Way now takes a completely different route through this area, actually heading to the left at the crossing track along a route which ultimately now avoids all the road walking along Mill Green Road. Anyway for my walk I headed along Mill Green Road before turning to the right along Mapletree Lane, again going slightly off route as the walk was marked on my map as continuing further down the road before heading back across the common to join Mapletree Lane a bit further down. Just to add further confusion to navigation in this area, on both my old map, and the latest version, the St Peters Way is shown as heading down Mapletree Lane as far as Mapletree Farm however on the ground the route has been altered and it now joins a footpath on the left at the point where Mapletree Lane bends sharply round to the right. 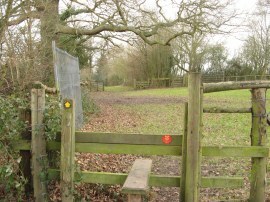 This revised route, photo 13, which is followed down across a number of fields and paddocks to Beggar Hill, is clearly marked with the walk way markers throughout its length. At Beggar Hill the St Peters Way heads along the road to the right, continuing ahead at a T junction, which is close to the point where the route as marked on the map is shown as joining the road. Reaching the end of the road the route crosses a stile besides a gate and continues up the driveway to Stoney Lodge. 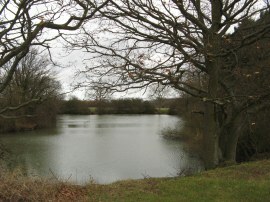 The route follows the driveway alongside a pond and past a house before joining a farm track running alongside the edge of a large open field with the trees of Fryerning Wood away to the left. 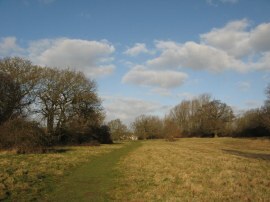 Leaving the track, I then joined a footpath that headed across the open field towards an isolated clump of trees surrounding a pond, photo 15. The route then continues ahead across the remainder of the field before turning to the right after passing through a gap in the hedge. Here a broad grassy track is followed down the field edge to the end of he field, the path continuing ahead to join another short stretch of footpath across the middle of a field which leads down to the village of Blackmore. Reaching the road, photo 16, I finished this stage of my walk along the St Peters Way having walked a further 7.71 miles along the path. 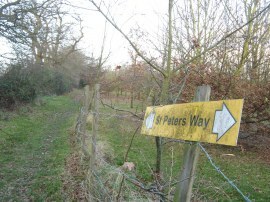 As usual I have uploaded the route of the walk which can be accessed here: St Peters Way Stage 5 Route. 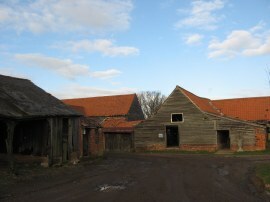 For this stage I was able to devise a pretty good circular walk back to the car at Stock which only involved a few short stretches of the paths I had walked along on the way out and reaching the car I had walked a total distance of 16.5 miles for the day. I now have under five miles left to do to the end of the path in Chipping Ongar which hopefully I will be able to walk in the next few weeks before starting my walk around the Chiltern Way.